Special thanks to our IAIA16 sponsors. IAIA welcomes conference sponsorship in any amount. Sponsorship can be applied either toward specific components of the conference program (e.g., coffee breaks, plenary sessions) or as a general contribution. Please see the IAIA16 Sponsorship Opportunities brochure for more details about what can be sponsored and the benefits available to your organization. DOWNLOAD THE IAIA16 SPONSORSHIP OPPORTUNITIES BROCHURE (ENGLISH) (JAPANESE) for more details about what can be sponsored and the benefits available to your organization. DOWNLOAD THE IAIA16 EXHIBITOR FLYER (ENGLISH) for information about booths, display tables, delegate pack inserts, and advertisements. 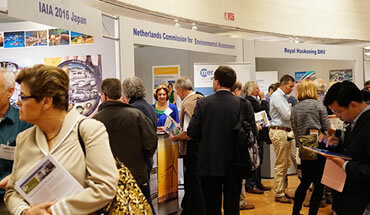 At IAIA15, held in Florence, Italy, delegates represented consultancies (31%), national or local governments (16%), educational institutions (16%), research institutes/laboratories (10%), industry (7%), NGOs/ENGOs (5%), multilateral development banks (5%), inter-governmental organizations (2%), donor agencies (1%), and other sectors (7%). If you prefer not to sponsor something specific, general contributions are always welcome and contribute to the overall success of the event. IAIA offers five sponsorship category levels: Reef, Island, Continent, Earth, and Premier. A detailed breakdown of benefits by category is available in the IAIA16 Sponsorship Opportunities brochure.